After two months living abroad in Paris, I was thoroughly unconvinced that it deserved its title as the city of love. The food? Unparalleled. The shopping? Heavenly. But the dating scene? Thus far, it had left much to be desired. Countless movies and books had formed an impressionist painting in my mind of what romance in Paris would look like. With Monet’s pastel dreaminess, my brain illustrated scenes of doves, rain-drenched embraces and Vespa rides through cobblestone alleys. Each one, more elaborate and impossibly enchanting than the one before it. 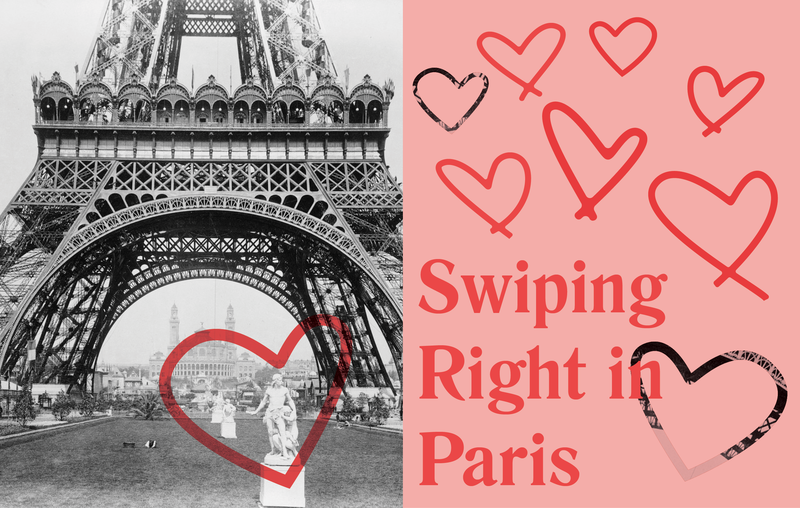 But after 60 days, no tender glances were shared with a stranger in any of the museums I had traveled to, no dashing gentlemen had asked what book I was reading on a park bench and no kisses were stolen on the top of the Eiffel Tower. So how was I, a hopeless romantic, supposed cope with the realization that Parisian romance looked less like a Monet and more like an abstracted Picasso or Rothko? I channeled this frustration and took to the internet. The answer was Tinder, or so I thought. Fundamentally, I stood opposed to Tinder—all dating apps really. To me, it advocated for convenience and superficiality over anything substantive. How was one supposed to tell the difference between a future boyfriend, soulmate and one-night stand based on three selfies and a summation of self that emphasizes brevity and wit over sincerity? It was a game made to boost egos, I thought. Or an online marketplace, where people were bought and sold with validation as the currency. But I couldn’t ignore the success stories. My best friend met his boyfriend of over a year on his first Tinder date. After one meeting and a few weeks, he found love. And he isn’t alone. Around 29 percent of Americans know someone who has been in a long-term relationship because of online dating, according to Pew Research Center. Who was I to ignore facts such as these? My hopeless-romanticism (or desperation, depending on who you ask) was consuming my day-to-day, so I prepared to swallow my pride in the name of (potential) love. I picked out three photos. In one I was hiking, to ensure I looked well-rounded and outdoorsy (already the persona-constructing was underway). Next was a closer head shot, so potential matches would know exactly what they were in for. Finally, I picked a photo of me and my friend at Halloween dressed as Aphrodite and Artemis, to prove I knew how to have a good time. I had curated myself into the most easily-swallowed pill possible, just like reducing a fraction. But I hadn’t downloaded the app yet, so the images sat in my “favorites” album on my phone, just waiting for me to pull the trigger. It felt like abandoning my morals, or worse—my integrity. I was in conflict with myself. The task was pushed off as a chore for the next evening. Instead, I chose to enjoy a day in strolling through Le Marais. My friend and I wandered, purchased some Mexican food and eventually settled for lunch at a touristy bistro adjacent to the Seine and across from the Louvre. Although frigid, it was an uncharacteristically sunny day, and the mismatched weather perfectly complimented my inner uncertainty. But my indecisiveness was quickly addressed—Paris intervened. Striding on the sidewalk a mere 10 feet from our table, was a boy I had a crush on six years ago during my freshman year of high school. We hadn’t been remotely close in school (at best we were acquaintances, and at worst, strangers), but for some reason, I called out to him. After initial pleasantries, he admitted that he did not recognize me. This only marginally offended me, and after a few minutes, we said goodbye. Later that day, I got a Facebook message from that same boy, who very apologetically corrected himself—he now remembered me. What this message also included was an invitation. A few texts later, and we had plans to get fondue and go dancing near Notre Dame. We sat in a small restaurant, walls covered in every kind of foreign currency imaginable, and talked for hours. Our waitress even had to ask for our table because we had taken too long. Strolling down the streets of Montmartre, tipsy on rose and delight, we made our way to a jazz club where we twisted the night away. With the same lightning-bolt speed and surprise as is experienced by the bumbling characters of love stories, I found myself in a whirlwind of romantic optimism. Even a person like myself couldn’t have foreseen the precarious series of events that had to have taken place to conceive this date. It was Parisian romance, just like the hundreds of directors and writers said it would be. He was only in town for the night because his acting demanded his presence in London, so it wasn’t exactly a saga of enduring and turbulent love with a Parisian backdrop. But it was exactly what I needed: one night of intrigue and implausibility. Needless to say, those three Tinder pictures have since been neglected and are collecting digital dust at this very moment. However, I do not condemn the users of Tinder like before, in fact, I think I understand them even better now. Technology helped my night of charms come to fruition. When a sign presents itself so clearly, I find it wise to listen, and what the sign told me was that there is still some real-life romance left for those who really need it. I still am not ready to concede that it is the city of love as depicted in media, but I can say with utmost certainty, that it is the city of chances. If there were a place on earth worthy of the title, it’s Paris.